AS promised, there was the chorus line during Manny's pompous birthday celebration, albeit a shorter one, and a taste of Broadway, too. Yes the Cabaret. The gaming tables and slot machines were there too. Sorry folks, nobody from General Santos City would like to find themselves landing on the front pages of national dailies and in prime time TV news rolling the dice, spinning the roulette or flashing their flushes at the poker table or grabbing the lever of those one-arm bandits. No high-rollers but a gamut of well-wishers. It was Las Vegas style, indeed, apart from Pagcor people whose faces have grown long all night trying to make the banker happy. Everybody got their wish to be at the scene and be seen at the city's biggest and grandest party that ended all parties in this part of Mindanao. No, they did not roll out the red carpet but where can you find a boxing ring with its red felt matting and flaming red cushioned ropes with no less than the President of the Republic at the presidential table that only sits ten people perched at the center of the spacious ballroom hall for everyone to see? If only those ubiquitous presidential guards were not around, the party would have not been stiff around the birthday celebrant. The overcast skies in the afternoon finally cleared up in the evening revealing the moon and the stars. Inside the ballroom, stars of all kinds invaded the hall. Manny Pacquiao was, of course, the biggest star of the night even President Gloria Macapagal Arroyo had to content herself with staying seated at the table enjoying the revelry around for three full hours. Seated at the presidential table with Manny and the president were, Top Rank's Bob Arum, Coach Freddie Roach, Pacquiao lawyer Jeng Gacal, Pacquiao business manager Eric Pineda, Denr secretary Lito Atienza and former Ilocos Sur governor Chavit Singson. Despite not being able to join her husband, Jinky Pacquiao greeted Manny via phone patch. The president left at 10:30 in the evening after Manny sang his hit recording Para Sa Iyo Ang Laban Na 'To. A taste of Hollywood, you said? How about our very own Arnel Pineda who continues to draw waves around the world of pop and rock music as the lead vocalist of popular American rock band, The Journey? On his own, Pineda could easily pack the house. But on this night, he was just a performer and entertainer, serenading Manny and the president with his soulful rendition of the Journey's signature song Faithfully. Filipina-Mexican rising star Jasmine Villegas who sang the national anthem during the Pacquiao-Diaz bout also performed for the Filipino boxing champion. So did Jennylyn Mercado, composer Lito Camu and novelty song icon Max Surban. The night's biggest performer, however, was Manny's mother Dionisa who brought everybody up to their feet when she danced the swing. Who says glamour and glitz in the Pacquiao family only belonged to Manny? Celebrities and starlets from Philippine cinema were there too headed by Richard Gutierrez and his parents actor Eddie and part time actress Anabelle Rama who were seen with Regal's Mother Lily Monteverde. Sarangani governor Miguel Rene Dominguez, who drove the president to the venue and brought her back at their Guest House in Alabel, Sarangani, however, could give the poster boys of Philippine cinema a run for their money and was dapper in his dark blue suit and towering figure. Mayor Pedro Acharon Jr., with wife, came in too but has to concede the night to his one time political party foe. There are other special guests who have stars literally written on their shoulders. Armed Forces Chief of Staff General Alexander Yano (four stars) was in his well-tailored suit and Major General Armando Cunanan of the 10th Infantry Division was resplendent in his barong. Former Pacquiao knockout victim David Diaz (who once saw stars courtesy of Manny's punches – pardon the pun) had his of 15-minutes of fame in the local shores and was deluged with requests of foto-ops. So were Venezuelan Edwin Valero, a Pacquiao challenger in the waiting, who gracefully obliged to pose for souvenirs, and former Olympic silver medalists Onyok Velasco and World Boxing Cup gold medalist Harry Tañamor. Food, beverage and alcohol flowed freely all night long - 120 cases of San Miguel Beer Pale Pilsen and Lights to be exact. Cases of champagne and sparkling wine, brandy and scotch whiskey were on the house. Ten of the freshest tuna catch for the day laid on the table for sashimi, sushi and shabu-shabu and cocktail bars were laid out at the entrance of the main ballroom. Two roasted calves and six pigs were still wrapped in the aluminum foil at way past 9p.m., suggesting food and beverage were no problem at all. At 10 p.m. a roasted turkey was still left untouched at one of the many buffet tables around the hall. The invitation was good for 1,500 and was strictly formal. Close to double that number probably showed up, some in their designer gowns and suits others in denims and T-shirts. At the Oval Plaza, hordes of Manny fans, over 6,00 of them according to reports, filled the 10 hectare park as they were entertained and dined, albeit in lunch boxes. No problem if they did not get to greet Manny their personal wishes. The fact that they too shared Manny's generousness was reason enough for them to go back home filled and full. They have the stars to thank. The afternoon overcast did not turn into rain and the stars were bright. Even if they have to content themselves with rice, sauteed noodle, beef stew, fried buttered chicken and a tetra pack juice. Who says all men are created equal on Manny's birthday night? 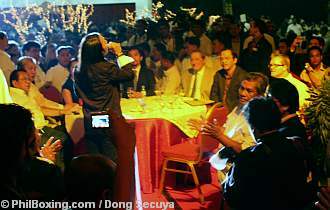 Photo: American band Journey frontman Arnel Pineda sings during Pacquiao's birthday bash.